Ideális eszpresszó és brew-hez is. A kések elhelyezése és a belső kialakítása miatt, majdnem 0 a retenció! EK 43 is the best-known model of Mahlkoenig. This high-class device has won recognition among the best baristas from all over the world. What distinguishes it is the consistency of work, even grinding, versatility of application, and great design. EK 43 guarantees even grinding every time. It is a crucial factor in brewing coffee - fractions of coffee of even size translate to ease in extracting pure taste from the bean without any hints of bitterness. 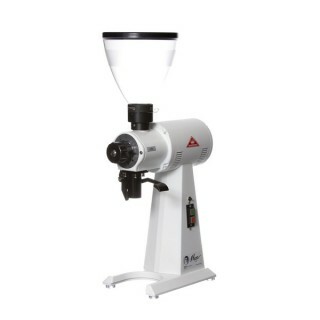 The grinder offers multiple finenesses of grinding which means it can be used in grinding beans for espresso, alternative methods, and even Turkish coffee. The grinding level is adjusted with a handy and well-described knob. Depending on the fineness of grinding the capacity of the device is from 1200 to 1500 grammes per minute. A holder by the outlet allows clamping a bag where the coffee can be ground directly. Hopper holds up to 1.5 kg of beans. EK also constitutes a great element of interior design of every catering facility thanks to its industrial look and high-quality finishing. The inside of the grinder includes, among others, cast steel grinding discs of 98 mm diameter and an efficient motor of 1300 W rating.